This is a quick post to introduce you to the new features of Blogger Post Editor. Blogger team have added 2 great features in Post Editor which will make your post more beautiful and it will be easy to write a post. Now you do not have to manually add heading tags for the headlines of your Post. Now you can do it automatically and more professionally. As you can see in image above there is a drop down menu which contains different Heading options. Use them according to your Post demand. Just check them one by one. This is an awesome feature for all new bloggers. 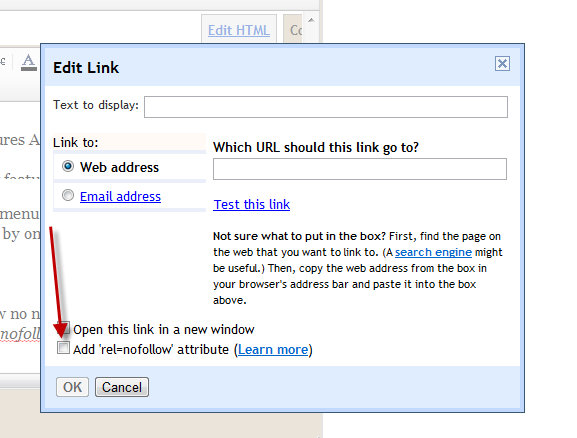 Now no need to manually add the nofollow tag to the outgoing low quality link. Simply check the nofollow box and that's all. See the image below. NOTE: Be careful ! You must check every time when linking any link. Because you know when you check any box it is permanent so by mistake do not add nofollow to good quality and internal links. Always add links carefully because both Internal and External links are the roots to get good Page Rank. I got my First Medal Will deliver more posts to BeH. I consider myself as the part of this Blog. BloggingeHow | Making Blogging Simpler: Blogger Post Editor Update - Nofollow, Heading Tags Added!